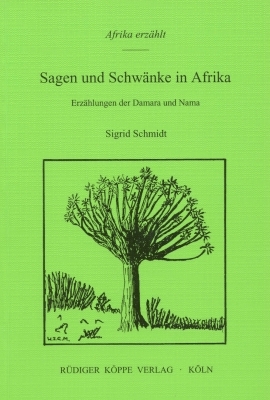 The author has already described tales, fables, and premaeval stories in four volumes of the series Afrika erzählt. In the present work she concentrates on the ‘real’ stories, the legends and merry tales. For the first time the attempt is made to give a cross-section through the legends of an African ethnic group, and to capture the huge scope from the dark to the ridiculous, from the descriptive to the preaching. No other narrative form reveals so much about the Namibian people, and their feelings, beliefs, and thoughts today. The contents include entertaining ghost stories, but also acutely felt personal experiences with – from our point of view – supernatural beings. All texts are accurately translated in a fluent legibility from the author’s cassette recordings, and they illustrate the distinct atmospheres and ways of telling. Finally a description of two narrative evenings is included. In the second part the reader can find background information about the narrators and the circulation of the legends. It shows that different African subject matters are already known in Europe, and are even found in our newspapers as “true incidents” in our neighbourhoods. The third part examines the nature of the African legends, their relation with tales and merry tales, the crucial points in their contents, and their relation with life, and belief traditions of the narrators.